My first visit to Cameroon in summer 2010 occurred thanks to an invitation by the Goethe-Institut Yaoundé and the independent art organization Doual’Art. 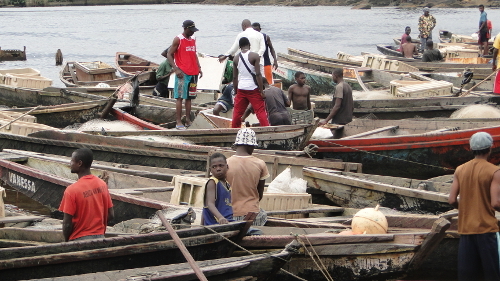 During my residency I prepared a sound installation for a festival in Douala in December. I also conducted a workshop, together with Eckehard Güther, for young local musicians and artists on the theme of field recordings. Field recordings? 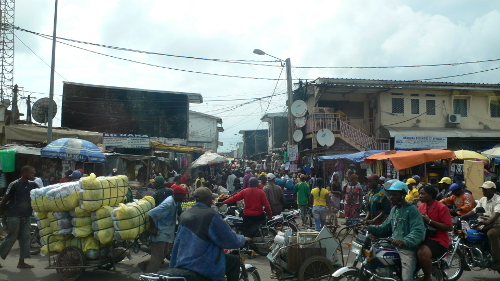 In the cities people are surrounded by distorted sound systems playing lo-fi illegal copies of Cameroonian as well as international pop music. The sounds from church services, instruments and voices are all amplified as well – the louder the better. A lot of what you hear comes from speakers. The workshop held surprises for everybody, most of all for us: the participants led us to many hidden places with sounds they thought would be of interest to us. And we noticed that we were mistaken in our prejudice of sounds which might be unheeded: these people did listen, they had the most musical ears, they knew a lot about their „field“. But so far they had not felt any necessity to store these sounds. 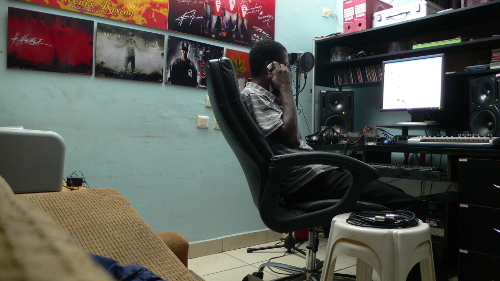 So we started our exchange: they got the recording facilities and we got a little bit of their ears. 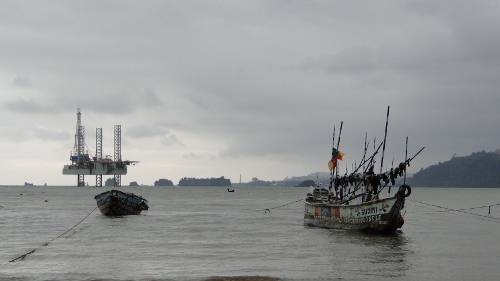 Cameroon is a noisy country with unexpected and subtle soundscapes. We were brought to places we never would have discovered ourselves. 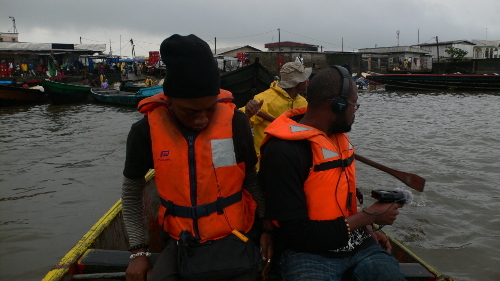 This was the basis for a „sound diary“ which was continued during a long trip into the North of the country and as well during our second visit in and around Douala in the winter time. Music is one of the most important forms of communication in Cameroon, a country with hundreds of different languages and ethnic groups, it is a link which binds them all together. I am glad that we could participate in this sonic experience with the help of many local people. The places we recorded were not arranged in advance, we just happened to be there and sometimes the recordings were made with quite simple equipment. Listening was the most important experience and hopefully some of this personal experience will shine through in this release. 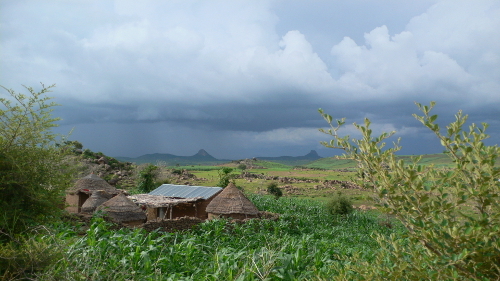 Recorded in Cameroon by Christina Kubisch, Eckehard Güther and Dieter Scheyhing between July and December 2010. Mixed and assembled by Christina Kubisch and Eckehard Güther in 2013 at Studio Hoppegarten. 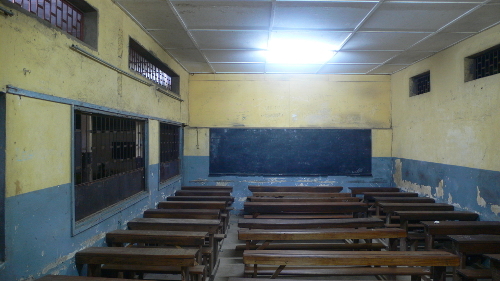 The two trips to Cameroon were made possible through an invitation from the Doul’Art Center, Douala and the support from the Goethe-Institut Yaoundé. I am mostly familiar with Kubisch via her incredible minimal drone-driven modern classical compositions, which she has been making since the 1970s. Here, however, she collaborates with Eckehard Guther on a collection of thirteen pieces recorded throughout Cameroon after their having organised a number of workshops throughout this country dedicated entirely to field recordings. The idea was to work with local musicians and artists on the idea of paying attention to the sounds around them; something both Kubisch and Guther initially felt the country’s inhabitants might not do yet were surprised to discover just how much sound does impact on people’s lives. The recordings themselves are taken from the duo’s travels throughout the country and depict everything from a wide variety of natural sounds to that of traffic, a street procession (replete with musicians playing away) and a choir rehearsal. Nothing has been processed, leaving each piece to serve as a nice and tantalising snapshot of a country which clearly has much to offer in terms of sound and beyond. What is especially interesting, however, is that this work only goes to illustrate just how much sound is heavily integrated into people’s lives, no matter where they live or how much they might not even concede to it. RJ. […] These last two releases are pure field recording. Rodolphe Alexis with a walk through the forests of the Lesser Antilles, Gaudaloupe and Dominica and Kubisch and Güther in the Cameroon. Both come to life with a tropical rainstorm where the heavens open and the locals get a taste of God moving his furniture about. In the Cameroon the rain peters out on a tin roof until the cicadas, birds and other insects can be heard once more with Alexis the results are even more Biblical. Kubisch and Güther’s made a deal with the locals in a I’ll show you mine if you show me yours kind of fashion. With Cameroon being a noisy place by nature [car horns, markets, amplified music etc.] they thought that it might be in the locals interest to hear what went on outside these everyday noises. The locals then took them to places they thought might interest them, hence the church, an abandoned hotel, the river, a national park. The results veer from the chaotic [the church service] to the sublime [the end of that rainstorm] with both sides coming out winners. Holding workshops for the locals Kubisch and Güther soon realised that the locals did indeed take heed of what was going on around them ‘but so far they had not felt any necessity to store these sounds’. On Morne Diablotins [the name of the highest mountain in Dominica] Rodolphe Alexis takes a walk with recording equipment in hand passing Jaco and Sisserou, the endemic species of parrot, but failing to locate any mountain chicken’s or giant frogs. There’s always a next time. Its his mission to record and observe giving us the purity of the rainforest in all its verdant glory. And whilst I thought that these recordings weren’t anything out of the ordinary [preferring David Tudor’s electronic take on the rainforest if pushed into a corner for an opinion] they do draw you in. Especially on the longest and most immersive track, the 28 minute ‘A Night in Grand Bay’ where a tropical rain storm, insect chatter and the agitated calls of parrots all joyously mingle. Bird and insects sounds dominate on all of Morne Diablotins. As they should. Another solid set of releases from the ever reliable Gruenrekorder. This cd, from Gruenrekorder, is presented to their usual smart standards; with a full colour digipak and booklet. 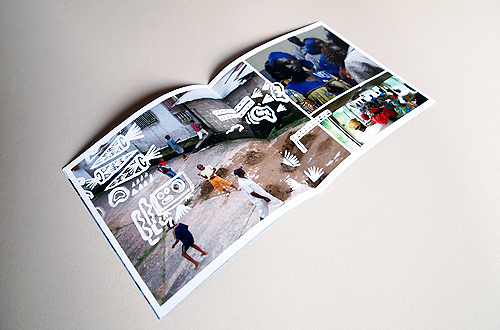 The album contains thirteen tracks, recorded in Cameroon by Kubisch and Guther; all of which are field recordings, unprocessed but sometimes collaged. I must admit, that of recent I’ve been non-plussed by the field recording albums I’ve heard. They’ve either been transparently documentarian, or they’ve been cached in highly conceptual terms; often they’ve offered very little to the ear, as such. 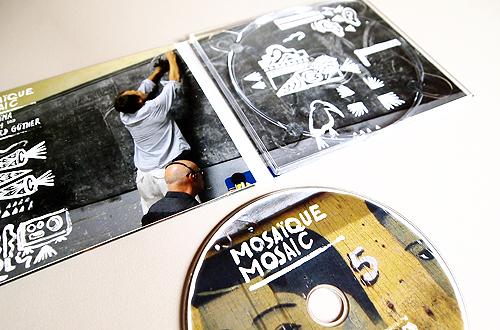 “Mosaique Mosaic” is a reasonable compromise of the above. There’s no clever theory propping up the recordings, though; instead, the recordings depict slices of Cameroonian life, with a few distinct treats for the ear along the way. The tracks cover a broad swathe of local life, starting off with a hysterical preacher casting out a demon (his words, all the while, being shadowed by a translator), moving through the clanging metals of a workshop, visiting an abandoned hotel at night and following a ramadan procession. There’s a great colour and vibrancy to be found here, exemplified best – in its generality – by the track “street atmosphere”. Here Kubisch and Guther document the very noisy surroundings they find themselves in, complete with the distorted tones of music buzzing through tinny speakers. This cacophony is also to be found, somewhat ramped up a notch, in “abandoned hotel at night”; which is an incredible barrage of animal howls, under a drone of chirruping insects. This desire of nature to keep up with noisy humans is also found on “national park waza”, which catalogues a wealth of almost-electronic sounding insects and birdsong. The last piece, “night and morning atmosphere”, is the longest track by far. It begins with the sound of rain, which gradually lessens to reveal a shimmering drone of insect noises. This night then progresses into day, with a more ethereal insect drone and a chorus of birds: cockerels crowing marking the dawn. This track is one of the few on “Mosaique Mosaic” that really engage the ear, but perhaps the best example is “trainride transcam I”. This pleasantly “sound-y” track essentially follows an insistent squeaking through a changing landscape, with the rusted squeak taking on the guise of a crafted electroacoustic line. Strangely beguiling stuff. I’m not sure who to “sell” this album to. Its a pleasant listen, but not something that has any danger of dominating my stereo. It is, what it is, really: a colourful snapshot of an environment abundant with life and colour. Its also an environment noticeably marked by noise, both human and non-human. This is all well-documented by “Mosaique Mosaic”, but my picky ears want more and its only really “trainride transcam I” that satisfies in that regard. The cornucopia that is Gruenrekorder continues to spill out the most imaginative field and sound art works. It does an absolutely phenomenal job of recording and playing with our world and everything in it. While its back catalogue has long been proof enough, just look at one of its latest batches, including the untreated, spellbinding Morne Diablotins by Rodolphe Alexis, a brightly-feathered, humid hike through Guadaloupe and Dominica, a small island in the Lesser Antilles; or The Hebrides Suite, quite the contrast insofar as its author, Cathy Lane, hopscotching across the isles, treated and arranged her field recordings into a kind of aural equivalent of the classic oral histories of Studs Terkel, I-Chinged into a Celtic circus under the same big top as John Cage´s Roaratorio. Sound artist and professor of sculpture and audio/visual arts Christina Kubisch found in Cameroon a society connected by speaker wire. “In the cities people are surrounded by distorted sound systems” playing lo-fi, bootlegged pop, where “church services, instruments and voices are all amplified as well – the louder the better”. She also discovered a local population that had developed a sensitivity to the most subtle of sounds, too. 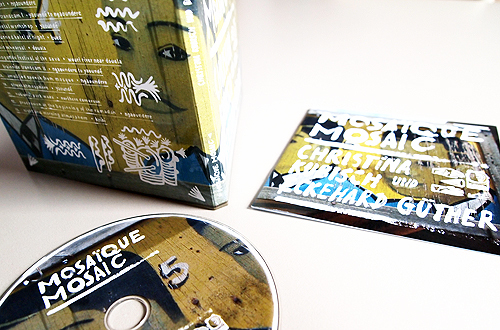 During an artistic residence in Douala, its largest city, Kubisch and countrymen Eckehard Güther (who mixed and assembled the album with Kubisch) and Dieter Scheyhing attempted to capture this listening. Together they´ve captured the march of a brilliant parade. From the bilingual fire and brimstone sermon (the English translator seeming far more firey than the French preacher), down the street past market stall touts, traffic jams and festival processions, they enter soft nights where the clamour carried by the air comes not from men but beasts and insects. By the sea, they witness the bell ringing, horn tooting festival in which the Sawa of the coast implore Jengu water spirits for prophecy. Epiloguing with rainfall spattering on a tin roof before subsiding as all the wildlife it refreshed raises its voice, Mosaïque Mosaic assembles the tesserae of a journey ranging widely east and west, and south from a metal shop in the capital to the Waza National Park and its elephant reserve in the far north, finely balancing the sacred and the profane, in vivid, living colour. «Yes – oui – yes – oui – yes – oui»: Die Stimme des Predigers überschlägt sich beinahe, dicht gefolgt von einer nüchtern vorgetragenen französischen Übersetzung. Bei «I set them on fire» antwortet das Publikum, dann setzt der Chor ein, begleitet von Keyboard und Schlagzeug. Ein Gottesdienst im englischsprachigen Küstenstädtchen Limba im Südwesten Kameruns bildet den Auftakt zu einer Rundreise durch die Soundscapes des Landes. Auf Einladung des Kunstvereins Doual’­art – seit 25 Jahren eines der interessantesten Zentren zeitgenössischer Kunst südlich der Sahara – wa­ren Christina Kubisch und Eckehard Güther 2010 für einen Workshop zum Thema Field Recording nach Douala, Kameruns größter Stadt, gekommen. Anders als im Falle der ethnologischen Feldaufnahmen vergangener Zeiten steckt dahinter allerdings nicht der Versuch einer Klassi­fizierung, sondern es geht um das Hören an sich, um musikalische und außermusikalische Klänge, die Kubisch und Güther zu einem sensiblen Hörstück montiert haben. Auch sind die Subjekt-Objekt-Positionen anders verteilt, denn es waren die Workshop-Teilnehmer, die sie an Orte geführt haben, die interessante Hörerfahrungen bieten: abseits vom allgegenwärtigen Lärm des Verkehrs, der Ghettoblaster und Sound Systems. 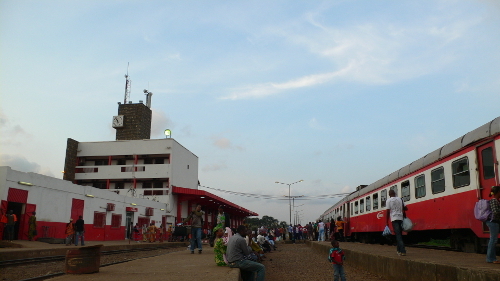 Marktschreier; das rhythmische Tockern der Räder auf einer Bahnfahrt von Kameruns Hauptstadt Yaoundé nach Ngoundéré; Hundegebell und krähende Vogelrufe aus der Weite des Raums in einer nächtlichen Hotellobby; das jährliche Na­gondo-Festival der Sawa bei Douala; die Stimme des Predigers in einer Moschee und eine Prozession mit Schalmeien und Trommeln zum Beginn des Ramadan; Insekten und Vogelgezwitscher in einem Nationalpark – solche Klänge sehr unterschiedlicher Herkunft setzen sich zusammen zum Hörbild eines ganzen Landes, wie es seit Luc Ferraris Promenade symphonique à travers un paysage musical, aufgenommen 1976 in Algerien, nicht wieder in vergleichbarer Qualität entworfen wurde. Die große Kunst Kubischs besteht im unvoreingenommenen Hinhören und in der transparenten Wiedergabe der Klänge, gleich ob es sich um den mehrstimmigen Dur-Gesang einer Chorprobe, das vielstimmige Hämmern in einer metallverarbeitenden Werkstatt, Highlife-Gitarren oder den Anlasser eines Motors handelt. Es sind immer prägnante Klänge, deren Polyphonie zum Eintauchen einlädt: Man fühlt sich von Tönen und Geräuschen umgeben und beginnt Landschaften zu imaginieren. Umso mehr, als Kubisch und Güther sich und den Hörern viel Zeit lassen, sich in die einzelnen Aufnahmen einzuhören – die umgekehrt des geduldigen Zuhörens wert sind. Zum Schluss lässt eine rund 16-minütige Passage eine ganze Nacht vor dem inneren Ohr und Auge erstehen: Anfangs trommelt der Regen heftig auf ein Wellblechdach. Mal quietscht eine Tür, dann fährt ein Fahrzeug vorbei. Als der Regen nachlässt, tritt der Gesang der Zikaden her­vor. Immer stiller wird es, bis schließlich mit Vogelgezwitscher, Hahnenschreien und Weckrufen ein neuer Tag anbricht: nicht anders als anderswo auf der Welt. W prawdzie album „Mosaïque Mosaic” ukazał się w ubiegłym roku, ale jak widać musiał poczekać na specjalną okazję. Christina Kubisch (ur.1948) to jedna z najważniejszych niemieckich artystek. Od końca lat siedemdziesiątych w swojej twórczości skupia się na instalacjach i rzeźbach dźwiękowych oraz pracuje ze światłem. Jej poszukiwania oscylują w obrębie muzyki elektroakustycznej. Na koncie ma niezliczoną ilość nagród i wyróżnień. Przez wiele lat wykładała na prestiżowych uniwersytetach. Obecnie mieszka w Hoppegarten koło Berlina. Zaś Eckehard Güther (ur.1978) to dużo młodszy kolega Kubisch, z którym współpracuje od 2006 roku. Razem przygotowują liczne instalacje dźwiękowe oraz interesują się nagraniami terenowymi. – Moja pierwsza wizyta w Kamerunie, miała miejsce latem 2010 roku, kiedy to zostałam zaproszona przez Goethe-Institut w Jaunde i niezależną organizację sztuki Doual’Art – pisze Kubisch. Kilka miesięcy później Kubisch wybrała się ponownie do Kamerunu, lecz tym razem już w towarzystwie Güthera, gdzie razem prowadzili warsztaty dotyczące sztuki field recordingu, zapraszając do wspólnej zabawy miejscowych muzyków i artystów. Na płycie „Mosaïque Mosaic” usłyszymy bardzo różne dźwięki, począwszy od liturgicznego śpiewu, brzmień lokalnych instrumentów, rozmów, odgłosów podczas nocnej jazdy pociągiem, dźwięków natury, a kończąc na kameruńskiej i światowej muzyce pop, którą można usłyszeń na ulicach i jest najczęściej odtwarzana z nielegalnych kaset. Kubisch i Güther wciągnęli w swój projekt także zwykłych mieszkańców Kamerunu, którzy zaprowadzili artystów w przeróżne miejsca. I jak niemieccy twórcy przyznają, pewnie nigdy by nie odkryli tak wielu istotnych miejsc. Album „Mosaïque Mosaic” przedstawia nam Kamarenu jako głośne, gwarne i zatłoczone państwo, a z drugiej strony odnajdziemy mnogość subtelnych dźwięków. 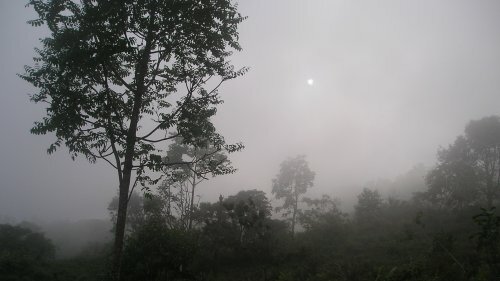 Najbardziej zaskoczyło mnie ostatnie nagranie „Night and Morning Atmosphere_kribi” ilustrujące moment na styku nocy i świtu, gdzie nieregularne oraz intensywne spadanie kropel deszczu na metalową blachę przypomina grę improwizującego perkusisty. Po chwili deszcz przestaje padać i słychać, jeśli jest to możliwe, jak faluje gorące poranne powietrze, a w tle „hałasują” całe zastępy owadów i ptaków. Niewątpliwe materiał z krążka „Mosaïque Mosaic” został dobrze zrównoważony przez Kubisch i Güthera. Nie poświęcili swojej pracy jedynie industrialnym efektom, lecz zachowali znakomitą równowagę pomiędzy odgłosami miasta a światem przyrody. Myślę, że dzięki tej płycie uda wam się poczuć tempo ulicznego życia w Kamerunie, jak też wyobrazić sobie niezwykły świat tamtejszej przyrody. Miejscami jest to fascynująca podróż do środka lasu. Po wysłuchaniu albumu „Mosaïque Mosaic” przekonacie się, że Afryka jest na wyciągnięcie ucha. 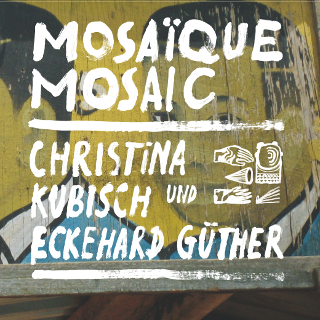 Eine wunderbare Reise ist auch die CD „Mosaique Mosaic“ von Christina Kubisch und Eckehard Güther, auf der die beiden Künstler Feldaufnahmen aus Kamerun präsentieren. Kubisch war dort auf Einladung des Goethe-Instituts, um u. a. zusammen mit Güther einen Field-Recording-Workshop für junge einheimische Musiker durchzuführen. Die Teilnehmer führten die beiden an viele versteckte Orte, die sie für phonisch interessant hielten. Es zeigte sich, dass Kameruns akustisches Umfeld jede Menge Entdeckungen bot. In einem Land, in dem hunderte verschiedener Sprachen gesprochen werden, ist Musik ein sehr wichtiges, wenn nicht das wichtigste Kommunikationsmittel. Die Aufnahmen führen den Hörer zu wunderbaren Chorproben, in die Werkstätten der Schmiede, in leidenschaftliche Gottesdienste, manchmal hört man auch nur das Quietschen der Verstrebungen bei der Zugfahrt übers Land oder das Gewusel und Gequatsche der Leute auf der Straße. Sehr unmittelbar. Eastern sounds are unfamiliar to most Western ears, and vice versa. What seems innocuous in one territory may be misinterpreted in another. Never is this more apparent than on the opening selection of Mosaïque Mosaic, as what seems at first to be a militant speaker turns out to be the voice of a church evangelist at a Sunday service. The difference between expected and apparent timbre would be a wonderful subject for study in international relations. Do we really understand each other? If not, what would it take? Most of the field recordings arrive here unadorned: an abandoned hotel, a street market, a national park. Together they form a mosaic of the nation, or as the artists amusingly put it, a mosaïque mosaic, which may seem like it means “music mosaic”, but is literally “mosaic mosaic”, a clever challenge to those who speak only one language. Even more clever is the inclusion of the fourth track – I’ll get to the title in a moment – which seems like a performance from the world’s worst drummers. While listening, Western guilt kicks in; who are we to judge such musicians? Perhaps they are considered brilliant in their own land. But the joke is on us: the track is called “small metal workshop”. Supposition after supposition is disproven along the way. 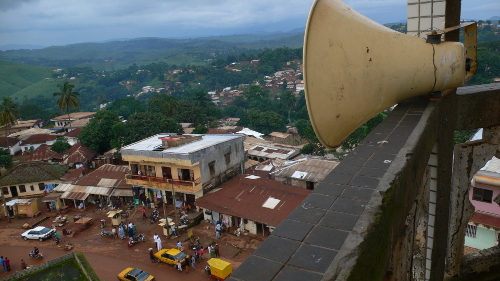 Cameroon may be a “loud nation”, but the residents also enjoy quiet noises. They lead the field recording artists to somber spaces in which the sounds of crickets, sheep and dogs may be captured. In a manner similar to that of Cathy Lane’s The Hebrides Suite, the human sounds begin to dissipate midway through the tapestry; the closing piece, “night and morning atmosphere”, presents a peaceful landscape, as far from the initial piece as one can travel in timbre. Or perhaps the two are closer than we think; such is the nature of the project that it challenges listeners to reevaluate their initial impressions. As Kubisch writes, “in Cameroon, music is a link which binds together hundreds of different languages and ethnic groups”. The wonder of this recording is that the home listener becomes part of that mosaic. My ongoing self-examination re: field recordings, to wit: why I enjoy some significantly more than others, continues apace. This, for reasons that are hard to pin down, falls squarely into my comfort zone. Compiled from a 2010 sojourn in Cameroon, Kubisch (who does fascinating electronic work on her own) and Güther fashion a wonderful, well, mosaic, of life there, however small a portion they represent. In this case, it’s partly due to the in and out nature of the musical elements presented. The disc open with a standout track, a church service where a strident female voice declaims in English, each phrase quickly translated by a male voice into French, including a great string of „Yes!“ „Oui!“ „Yes!“ „Oui!“, etc., before merging into a heartfelt hymn. We walk through metalwork shops, take trams, eavesdrop on a choir practice, listen to announcements from a mosque PA, wander the streets and countryside. Their choices happily de-emphsize the overtly (to Western ears) exotic, giving as fine a sense of place, though different, as they might have done on the streets of Berlin. Beautiful, lengthy conclusion with rain in the distance, irregular drops on nearby metal surfaces, even mixtures of faraway traffic, insects, birds, roosters. Excellent job, one of the best works in this area I’ve heard in a while. Still so hard to quantify. „Mosaïque Mosaic“ von Christina Kubisch und Eckehard Güther ist eine Klangreise durch Kamerun (Zentralafrika) im Jahr 2010. Es wurde im November 2013 vom Label Gruenrekorder veröffentlicht. Wir haben für euch reingehört. Die Wahl-Berlinerin und Installationskünstlerin Christina Kubisch zeichnete Kameruns Klänge während eines Workshops für hiesige Musiker auf. Dabei führten sie die Teilnehmer an versteckte Orte mit Klägen die für die Aufnahmen interessant sein könnten. Hierbei fiel Kubisch auf, dass Kamerun nicht nur ein sehr lautes Land sein kann, sondern sehr dezente Soundscapes aufweisen kann. Obwohl die Teilnehmer sehr musikalisches Gehör aufwiesen und sich der Klangvielfalt ihrer Umgebung bewusst waren, hielten sie es jedoch bisher nie für notwendig diese besonderen Klänge jemals aufzuzeichnen. Unverständlich, birgt Kamerun doch einige Klangschätze. 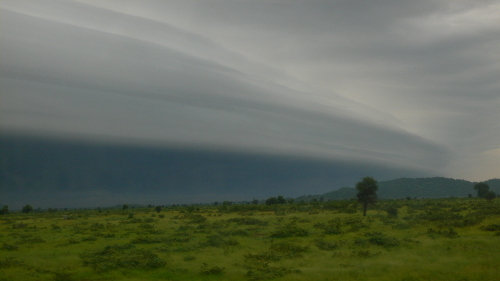 Die Aufnahmen wurden schließlich zu einem Tagebuch ihrer Reise durch das ferne Kamerun. Das Album beginnt mit einem sonntäglichen Kirchenbesuch (Sunday Church Service – Limbe), bei dem heftigste diskutiert und gebetet wurde. Kubisch und Güther führen uns danach weiter auf einen Straßenmarkt in Ngaoundere (Street Market – Ngaoundere) mit für uns unverständlichen Gesprächsfetzen, wiederholt gerufenen Kaufaufempfehlungen bis man schließlich mit beiden im Zug von Yaoundé nach Ngaoundere – einer Großstadt im Norden Kameruns sitzt (Trainride Transcam 1 – Yaoundé to Ngaoundere). Weiter geht es über eine Metall verarbeitende Werkstatt in Yaoundé (SMall Metal Workshop – Yaoundé), den nächtlichen Klängen außerhalb eines abgelegenen Hotels in Buea (Abandoned Hotel at Night – Buea). Grillenzirpen, Hundegebell und noch nie gehörte Vogelklänge füllen die nächtliche Klangatmosphäre. 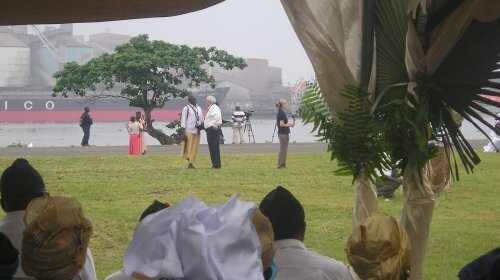 Es folgt eine Aufzeichnung eines Chors, sowie Klänge des Nogondo Festivals in Douala. Tröten, glockenähnliche Instrumente und letztlich Trommeln und Gesänge sind zu vernehmen. Danach geht es weiter im Zug nach Yaoundé, begleitet von fremden Klängen und Worten. Es ertönt eine Rede durch Lautsprecher, gefolgt von einer Straßenatmosphäre in Yaoundé, mit fremd anmutender, verrauschter und verzerrter Musik aus wohl sehr alten Lautsprechern. Urplötzlich verlässt man den Straßenlärm und findet sich im Nationalpark von Waza im Norden Kameruns wieder. Schlussendlich wird der Hörer Zeuge einer Prozession zum Beginn des Ramadans, bevor er in Kribi vom Regen geweckt wird um die ruhige Morgenstimmung der Stadt im Süden Kameruns genießen zu können. Alle Aufzeichnungen erfolgten in Stereo und wurden 2013 im Studio Hoppegarten Berlin bearbeitet und zusammengestellt. Eine dokumentarisch wirkende CD, ohne Sprecher mit reinen Klangeindrücken der besuchten Orte in Kamerun. Der Stereoklang ist normal weit, teilweise lässt er an Raum und klanglichen Höhen fehlen. Dies ist sicher auf die portable Aufnahmetechnik und die spontane Entstehung der Aufnahmen im Rahmen eines Workshops zurückzuführen. Das Album ist eine interessante Klangreise durch Kamerun mit bisher unbekannten und ungewöhnlichen Klängen. Im CD-Booklet finden sich ein paar Fotos mit Eindrücken von der Reise, sowie einer Einleitung zur CD von Christina Kubisch.